This space appealed to me because it honours the feminine way of working and provides an infinite potential to co-create beauty. Every single one resonates with me, because this embodies a new way of working, of creating an interlinked and synergistic ecosystem. I think the current splintered, antagonistic and hierarchical way of working is completely unsustainable. Celebrate failure– it’s the fastest way to learn. Fail fast and recover fast. And one day you’ll run out of ways to fail and voila, that day you will be successful. I am an Author, Healer and Entrepreneur. I worked with different start-ups in India for about 10 years before I moved to Canada. I wrote my first book ‘Winning at Parenting with Nath Yoga’ and started my Probiotic beverages company in Toronto. I am Yoga Mukti Therapist and absolutely love spreading the knowledge of relaxation. I also actively volunteer with Startup Toronto. Mugdha regularly brings her Gut Instincts kombucha and kefir to our Tuesday meetups. To place an order for this week, visit her Facebook page! We know how draining gift shopping can be, so we want to make it easy for you. Shecosystem happens to be home to several makers and creators whose beautiful products would make great gifts for your loved ones – or yourself. Here are a few products created by our members – along with special holiday promotional offers – so you can spread holiday cheer while supporting local, female-founded businesses. May You Know Joy and Seeds of Intention cards are a thoughtful holiday gift or stocking stuffer for friends, family, Secret Santas and teachers. And – the effects of this gift will only enhance over time. Both cards decks offer inspiration for reflection and intentional living. Cards are available at: www.mayyouknowjoy.com. Please contact Adrienne Enns at adrienne@mayyouknowjoy.com if you have any questions or require a special order. Be With is a set of thirty-six cards divided into six categories: write, speak, ask, rest, move and affirm. Each category suggests simple prompts to help you Be With yourself in the moment: whether that means slowing down, paying mindful attention, or giving yourself tender loving care. The cards can be used daily or weekly, or just when you need them. Shuffle them and pull one at random, or work through them category by category. It’s up to you. Bring the benefits of self-care into your everyday life and learn how to give yourself the love and time you give http://buyambienfastmed.com everyone else. Right now you have the opportunity to support Barbara’s indiegogo campaign and get your Be With Cards in time for the holidays! Everything that Christine designs + creates is meant to bring OM or calm to your home. She designs and hand prints original screenprint textiles and letterpress and lino block prints. She often uses words and inspirational sayings because she believes that inspiring words can elevate the energy in our home. Her line of inspirational sayings digitally printed is also designed to bring uplifting, positive energy to all rooms in your house. Check out her Etsy shop. Christine will also be at the One of a Kind Christmas 2016 show. You can find her in booth T11 for the full 11 days of the show. Christine has also created ‘The Soul Discovery Coloring Book’ which is an adult coloring book which is meant to help reader reach deep within themselves to connect with the divine. The book is an invitation to the reader not only to coluor the beautiful images found here,but also to access their own creative heART through journaling and creative exercise prompts. GUT INSTINCTS brews artisanal batches of Kombucha and Kefir that are seeded with the intention to heal your gut. They believe that fermented foods are an answer to a host of modern day illnesses and would love to share these healing elixirs with everyone. I believe there are many talented, heart-centered agents for change working hard to do good work. Beautiful work makes the world a better place. If I can help these champions continue their meaningful work, everyone benefits. I want to be an advocate and a cheerleader for business owners making a difference. This is where I feel at home and most authentic. I came here originally because I truly believe that self care is integral to the holistic health of myself, family and my business. Being in a service-oriented business, I need to take of me first so that I can give my best to my clients. I met a whole bunch of other like-minded women who share these values when I found Shecosystem. I’ve found my tribe! I love sharing my experiences in life and business http://ed-trio.com/buy-levitra-online with others on their own unique, but similar path. I always receive the same back without ever asking. Creativity. Compassion. Wellness. Energy. Community. I’d say the one most consistent way would be my daily morning sun salutations and affirmations. Do what feels good, no matter what it takes to get there. Find a way. And have faith. I love Chocosol’s dark chocolate hemp bar. Join resident Admin Guru + Techie Mentor – Lisa Kelly – with tech tips and tricks for simplifying workflows in your business using the latest technological tools. Our Shecosister Natasha Mitchell is collaborating with Katia http://www.bestxanaxcomparison.com Millar of Positive Fabulous Women to bring you ‘Inspired, Fabulous and Unleashed for 2017’! Are you ready to skyrocket your business and make 2017 your best year yet? Now is the perfect time to create your 2017 plans so you can hit the ground running, without having to stress about this over the holidays. …plus a hand-picked panel of business, marketing, branding and mindset experts as we lead you through a half-day intensive planning workshop. You’ll walk away with personalized business and social media plans that will give you the direction and focus you need to maximize your visibility and profits in 2017. You owe it to yourself, your business and your clients to achieve your full potential and this workshop will give you the knowledge, inspiration and drive you need to get you there. Sign up here – use Fab20 for $20 off registration before November 18! Everything is broken…what a great time to be alive. This motto drives Vicki Saunders, founder of SheEO. Our economic and educational systems are broken. So is our concept of work and success. And as we witnessed this week, so is the system that enabled a racist, sexist, bully to rise to the head of the United States. Great time to be alive? Really? It’s a great time to be alive because in the problem lies the solution. In becoming aware of what is broken, we unlock the potential to innovate and create systems that work. Acknowledging the brokenness allows us to liberate ourselves from the dysfunctional inertia of the status quo and move forward with renewed purpose. It’s the crack where the light comes in. The brokenness that Saunders is fixing is the world of funding for women’s enterprise. After years of running ventures in Toronto, Europe and Silicon Valley, Vicki grew dissatisfied with the existing venture capital model – and took it upon herself to create a new economic model for women entrepreneurs that combines the best of crowdfunding, coaching, buying power and networks. It is a model that she is spreading around the world with a goal of raising $1 Billion to support women’s enterprise. And it’s a movement that got her on a list of the World’s Top 100 Most Influential Leaders among a roster of notable women including Hillary Clinton, Michelle Obama and Oprah Winfrey. Women are dramatically underfunded compared to men, receiving only 2.7% of venture capital and 13% of all angel investment. Women struggle to get in the door to pitch their ideas to VCs and face unconscious bias once they’re in. Male-dominated venture firms are often dismissive of ideas that solve ‘female problems,’ ignoring a massive market. Investors overlook women’s enterprises that don’t fit the ‘unicorn’ model of success. And women with assets to invest are shut out and mystified by the old-school funding process. SheEO is creating a funding universe separate from the boys’ club where women-led ventures can define success on their terms, apply for funding from investors who speak their language, and democratize the investment process to build confidence in women wanting to invest in venture they can really get behind. SheEO is a global initiative to radically transform the way we finance, support and celebrate female entrepreneurs. 1000 women Activators across Canada give $1000 to create a million dollar pool of capital that is then loaned out to local female-led ventures, whom the Activators help select. With Activators as supporters, advisors, customers and connectors, SheEO Ventures are set up for immediate and accelerated growth. Selected ventures receive zero interest loans, a personalized guided development program, and access to a global network of female investors, advisors and customers (check out the 2015 Ventures). 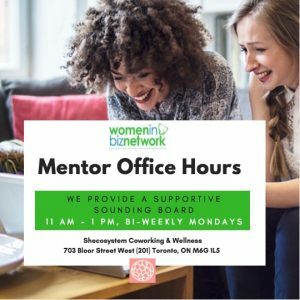 We would like to invite you to join SheEO Founder, Vicki Saunders, for a free Happy Hour and conversation hosted by Emily Rose Antflick, Founder of Shecosystem Coworking + Wellness, to learn about how you can get involved as a SheEO Activator or apply as to be a SheEO Venture in the 2016 Radical Generosity Campaign. Join us on November 23rd to learn more! This is a free event open to women only – Shecosystem members, friends and guests are welcome. Register below and please share!